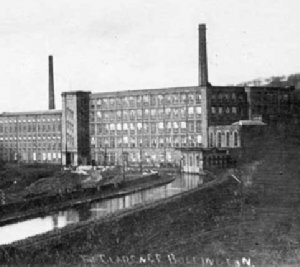 Clarence mill was one of the last in Bollington to have significant work done to enlarge or improve it. The chimney we see today was built in 1914 and further improvements were carried out to the structure of the mill in 1920. The chimney was the third to grace the mill. Right from its first construction in 1830 the mill was steam powered. But as the mill got larger and the spinning and weaving machinery got more sophisticated so the power requirements increased. The need for more power was answered by installing more and bigger boilers and furnaces. 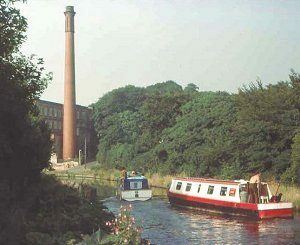 The first chimney was on the bank behind the mill where the houses in Clarence Terrace are situated today (right hand chimney in picture, above right). Later a second boiler house was built behind the then newer part of the mill, approximately where the multistory car park is today (left hand chimney in top picture, right). 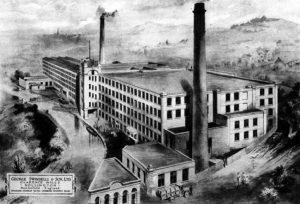 By 1910 the mill was feeling the need for a big upgrade in its boilers and furnaces and a new facility was built at the entrance to the canalside mill yard. The brick chimney we see today was to serve that. The chimney is the only part of that to survive, the boiler house having been decommissioned many decades ago after the mill turned over entirely to the new fangled electricity. For a time all three chimneys were standing around the mill but the two redundant ones were later removed (second picture, right). The brick chimney was built by H. Cumberbirch & Sons, a local building company established in 1900 by Harold Cumberbirch, grandfather of today’s directors of the company (2010), who oversaw the work personally. 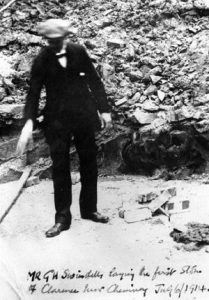 The first stone was laid by Mr G. H. Swindells, on 6th July 1914. Harold Cumberbirch is in the group picture (below right) – he is second from right, front row. In 1977 the chimney was giving cause for concern and the then owners of the mill proposed to demolish it. Fortunately, I understood at the time, they could not afford the £12,000 that demolition would have cost and so they had the top few feet removed. This seriously spoilt the look of the chimney because, like most factory chimneys of old, this one had a most attractive floral finish to the top. This was the bit that was removed – they broke it up and tipped it down the flue, so it lies there today broken inside the chimney. 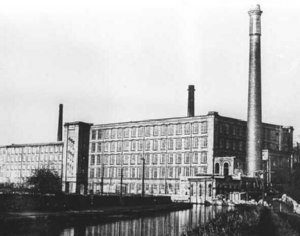 The history of Clarence mill is on another page. 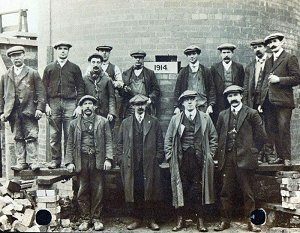 Pictures from Bollington Civic Society collection available online and at the Discovery Centre . The Cumberbirch pictures are not yet in the system.